I recently started using Tamari over whatever the standard US form of soy sauce is. The difference was something of a revelation. The depth and complexity of flavor is an order of magnitude more interesting than what I had been throwing around in the kitchen. Marinating some shrimp in it for 20 minutes was incredible. I'm wondering if there's more that I'm missing. Wikipedia has a load of info on Soy Sauce varieties, but it doesn't really answer the question of what they taste like or if there are certain uses they lend themselves to. I have 8+ types of vinegar in my kitchen. Is soy sauce a similar exploration? What are the common types of soy sauce? What is the difference in flavor profile? Is the usage different? Have I discovered a new kitchen addiction to drive my wife nuts? To muddy the waters further, add into the mix the fact that flavor is most deeply influenced by the proportion of soybeans to grains -- yet this crucial factor is not typically used directly as a categorization tool. To focus my research, I tried to find a site that felt as though the writer was speaking directly to you: one that would encourage, and not overwhelm or confuse, as you decide whether to become a soy sauce affectionado. Specifically, I wanted a resource that clearly addressed FLAVOR PROFILE and USAGE. Surprisingly, a blogger named Barbara came to rest as my #1 recommendation: Tigers and Strawberries. I like the simplicity and clarity of her writing style, as well as her experiential platform (complete with honest explanation of her biases). The endless comments after her post provide additional insights that might be helpful, as well. Of course, Harold McGee always provides wonderful more scientifically-based, yet still somehow understandable, explanations. He takes 5 full pages (496-500) in his book On Food and Cooking to discuss soy sauce in all its layered glory. Koi-kuchi Shoyu (Rich-flavor): This is the most commonly used shoyu in Japan, accounting for about 82% of all shoyu consumed. It imparts a deep body, a smooth sweetness, a light acidity, and of course, saltiness. Koi-kuchi shoyu is used in both cooking and as a table condiment. Japanese people will use Koi-kuchi shoyu in practically any recipe, and on any food. Usu-kuchi Shoyu (Light-flavor): Usu-kuchi shoyu originates from the Kansai region of Japan (south of Tokyo), and boasts a lighter color and more delicate flavor that is representative of the Kansai cuisine. About 15% of all shoyu consumed in Japan is this type. Usu-kuchi uses about 10% less salt than Koi-kuchi, due to its unique methods of fermentation and aging. As this is more subtle than Koi-kuchi, Usu-kuchi is used in dishes where you want the color and flavor of the main ingredients to shine through. Tamari Shoyu (Puddle): Primarily brewed in the Chubu region in the southwest of the Honshu island, Tamari shoyu is more viscous, with a deeper flavor and a distinctive aroma. Traditionally, this is used when enjoying sushi and sashimi (raw fish). Since this imparts a lovely reddish hue when exposed to heat, this is often used in stews and glazes. Saishikomi Shoyu (Twice-processed): Saishikomi is brewed in the San'in region of Japan, from the southern tip of Honshu in the Yamaguchi Prefecture and extending further south to the island of Kyushu. While the other shoyu types use a salt-water solution on rice malt, Saishikomi shoyu has an extra processing step that uses shoyu itself, hence the naming. Saishikomi shoyu has a lighter color, aroma and subtly sweet flavor, and is also known as "Kanro" (honeydew) shoyu. This is used more as a table condiment on sushi, sashimi, and cold tofu dishes, and is not really used in cooking per se. Shiro Shoyu (White): Hailing from the Hekinan region of Aichi prefecture in the center of the Honshu island, Shiro shoyu is even lighter than Usu-kuchi, with a very pale amber color. While definitely not strong in saltiness, it does impart a sweetness and distinctive aroma. This is used in cooking where the color of the ingredients might be comparatively pale and you wish to preserve or enhance that characteristic. The same applies for preserving the aroma or fragrance of the original ingredients. Hence, Shiro shoyu is used in dishes such as savory boiled custards and clear broths, as well as glaze on rice crackers or in pickling. Beyond the 5 main types above, there are further variations that are brewed with konbu kelp and dried bonito, or mixed with ponzu vinegar. There are also reduced salt shoyu types, too. And if you really want to take it up a notch, you can even try to blend some of the shoyu types to come up with your own variations. I think the wikipedia is pretty clear on the difference of the soy sauce, but I will give you little hints about Chinese and Japanese soy sauce. I am a Chinese. I think you can categorize the soy sauce from the 2 countries by their eating habits. Usually Chinese eats saltier cuisine, so their soy sauce is usually saltier, for example: frying, deep-frying, roast. The most common one is fresh soy sauce (生抽), which is saltier. And there are premium version for fresh soy sauce, for example, tóuchōu (simplified Chinese: 头抽; traditional Chinese: 頭抽) which claims to be richer in taste. Actually I think they are very similar in taste because the salty favour dominates your taste buds. Another kind of commonly used soy sauce is old soy sauce (老抽), which is less salty, sweeter in taste. Usually we use old soy sauce to give dark colour to cuisine so that it looks better. A Chinese old enough to cook will use these 2 kinds of soy sauce to combine the salty and sweet favour, of course, with the help of other things such as sugar. As for Japanese soy sauce, I am not so sure about differences between all kinds of soy sauce. As far as I know, and from the Japanese cuisine I've eaten, the soy sauce they use is usually sweeter in taste. (of course not as sweet as candy) You can figure out the reason behind their sweeter soy sauce from their eating habits. Japan is surrounded by the sea which is a very good source of fish, shrimp and other seafood which is sweeter and fresher in taste than pork/beef. Japanese consume the most salmon in the world. In order to have a better taste of the seafood, some of their soy sauce may also contain fish and Kombu for sweeter and fresher taste. Yes, Japanese soy sauce is good with seafood. By the way, tamari is a by-product of the fermentation of miso, which is an everyday cuisine for typical Japanese. The ingredient may vary in different manufacturers. You might want to check the label of your soy sauce for them. I think this conclude the rich in taste. I've spent the last 5 years living in China. 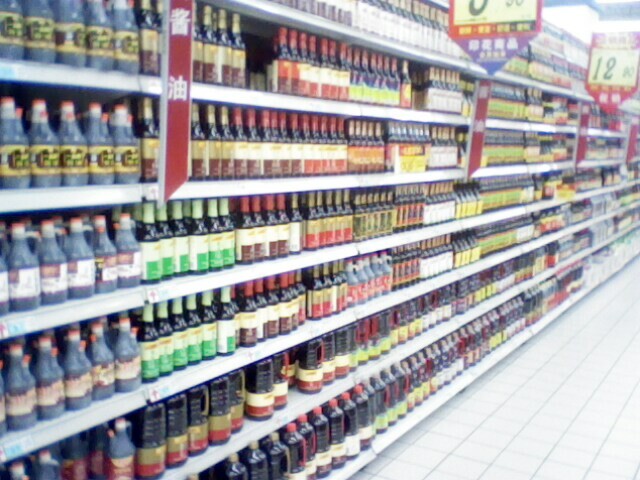 There is a huge variety of soy sauces available here. Each has it's own particular use. Some go well with fish or shrimp while others match up with dumplings. Since I don't read Chinese very well, I usually match up the pictures on the bottle with what I wont to cook. For dumplings I use a delicate soy sauce with a light flavour. This I usually mix with a dark coloured rice vinegar and some crushed fresh garlic. When doing fried rice, I use the Maggi brand sauce. It has a strong, rich flavour. With Japanese food such as sushi and salmon I use a Japanese brand. As the above poster noted, Japanese soy sauce tends to be sweeter. These can also be nice with fried dumpings. For sashimi fish and sushi, I mix the soy sauce with a little wasabi - a very hot kind of horseradish from Japan. Extra: Just went to the super market and grabbed a shot of the soy sauce isle which will give you a hint as to the variety available here.